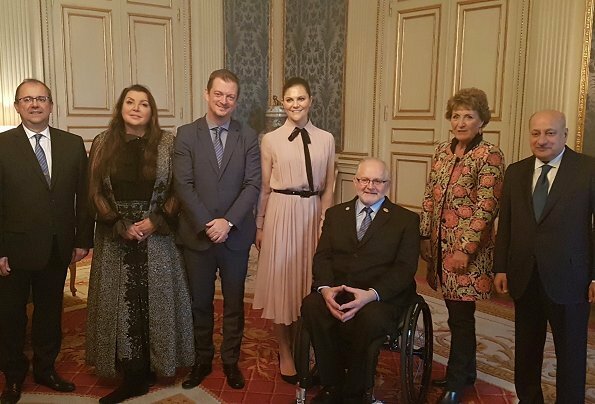 On October 25, 2017, Crown Princess Victoria of Sweden attended the meeting of IPC (International Paralympic Committee) Honorary Board held at Royal Palace in Stockholm, Sweden. (Princess Victoria wore a pleated silk shirtdress by Ralph Lauren). What is that long, black thing hanging in front? Is that a ribbon from the bow. Shorter ribbon would have been nicer. En de mevrouw in broek, H.K.H. Prinses Margriet der Nederlanden, Prinses van Oranje-Nassau, Mevrouw van Vollenhoven. I try not to see the bow at neck, without it this dress is lovely. Mixing a black bow with a palepink shirtdress isn't a good choice. Ok she matched a black belt and black shoes as well - anyway it looks old fashioned, particularly with her usual bun. She is a forty-year -old woman, she isn't 70. The black bow and belt are awful which is a shame as the dress is quite lovely in the other photos. A charming dress has been changed into something frumpy and unattractive. ik vind dit een zeer ouderwetse outfit. Het is niet flatterend. Ook haar kapsel is enorm saai, steeds weer dat knotje, er moet toch meer mogelijk zijn met haar lange haar.